I landed from San Francisco at Terminal 5C where I was connecting onwards to Gothenburg in Sweden to visit a friend. Concorde Room – open to first class passengers on British Airways only, and those with a Concorde Room card. Galleries First – open to BA Gold card holders and oneworld emeralds, as well as passengers travelling first class. 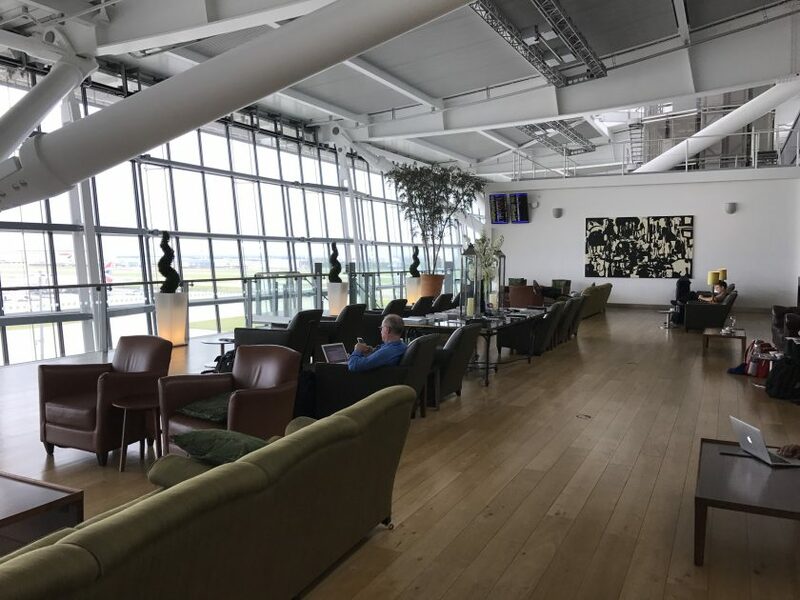 Galleries Club – open to BA Gold and Silver card holders, oneworld emerald and sapphire card holders, as well as all passengers travelling first and business class. 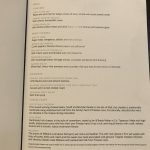 The Concorde Room is also open to passengers who have just arrived off a long-haul flight in first class, that’s over five hours in length and are connecting elsewhere. I qualified for entry as I’d just landed from San Francisco in first and was connecting onwards in Club Europe. It’s helpful to have both boarding passes available to show the lounge staff. 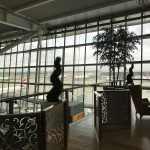 Having arrived at T5C, the second satellite of terminal five, I had to get a little train to the main terminal where I had two choices about how to connect. 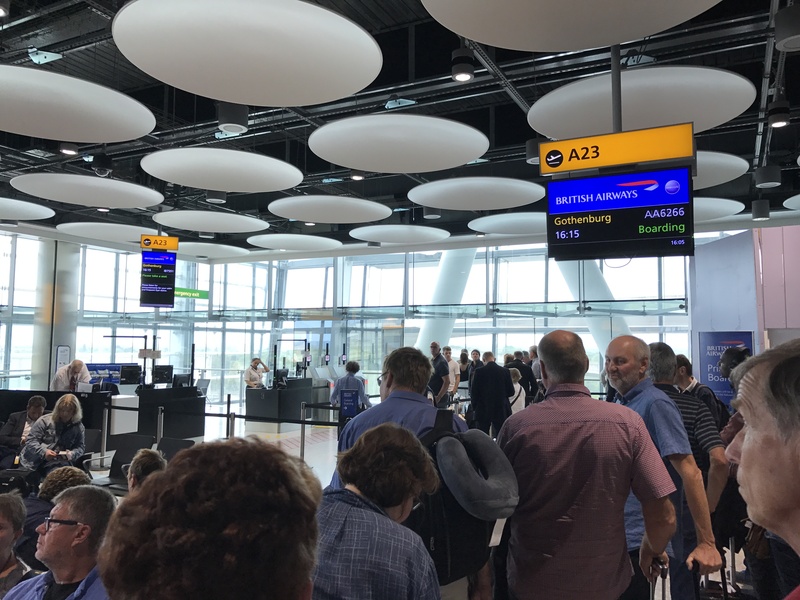 There first was to enter the UK, going through immigration and customs, then head upstairs to the departure area and use the new First Wing priority security lane. 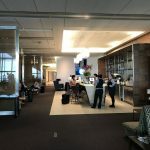 The First Wing is an excellent addition to the departure experience at terminal five with helpful and friendly staff leading you directly to the lounge. However when I walked off the train at T5A and went up the escalators to the border, the queues looked horrendous, even for the automated machines open to EU citizens. The queues snaked back outside the main hall. 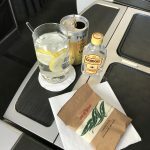 I therefore decided to follow the signs to flight connections. There’s a separate fast track queue for those with status or in a premium cabin, and I was pleasantly surprised to find that it was actually empty. Walking through the boarding pass check and then up the escalators to security there were perhaps ten people in front of me. A few minutes later I was airside and walked along the upper level to the south end of the terminal where the Concorde Room was located. My boarding pass was scanned and I was welcomed in. I actually walked straight in and then out again towards the shower complex as after ten hours on an aeroplane a shower was top of my mind. I presented my boarding pass to the staff there who informed me it would be an hour’s wait. I was pretty surprised at that given it was 14.30 and the early morning rush should have been well over by that point. However they gave me a buzzer to take which should light up when the next one was free. I returned to the lounge to get a light lunch. I wasn’t terribly hungry by this point but sat down in the dining section and had a look at the menu. 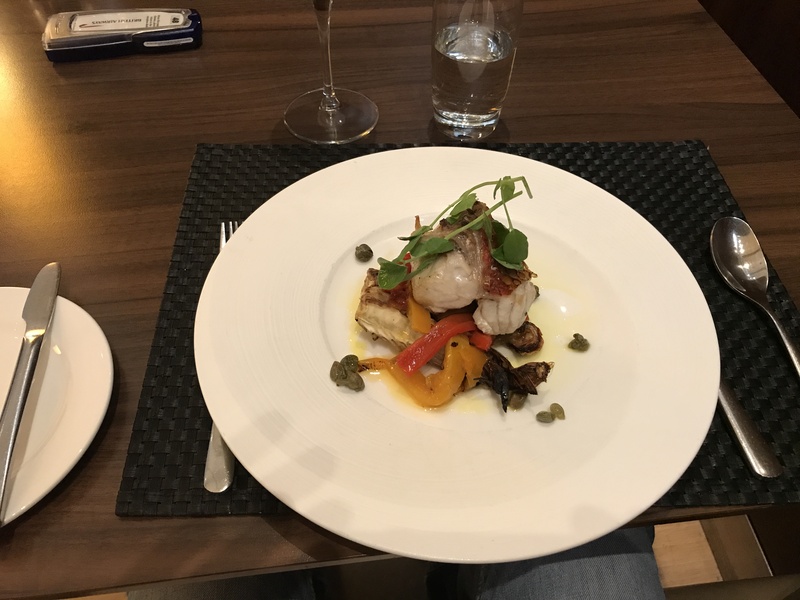 I decided to have the fig and then the red snapper for the main course with a glass of the Albariño. The starter and wine were quickly brought. Now I wasn’t particularly hungry, but it was miniscule. 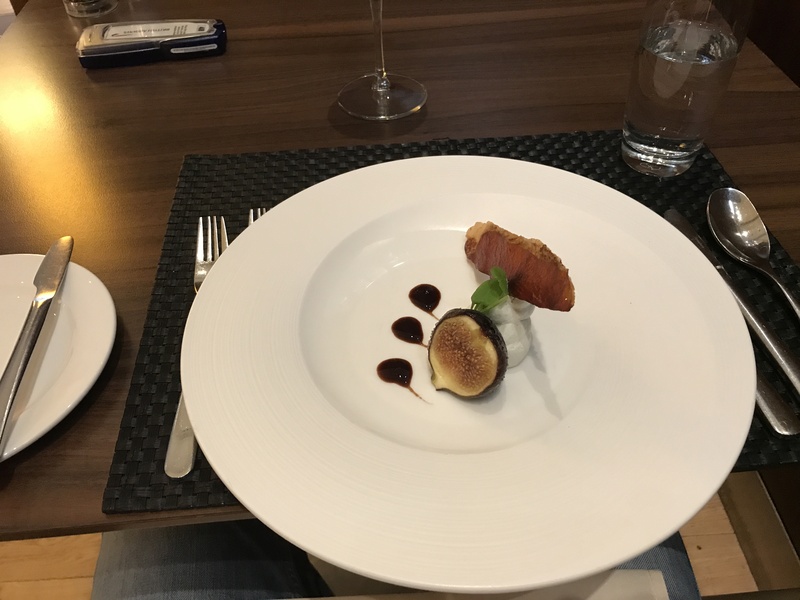 It wasn’t even a single fig – just half! The cheese was a kind of very light almost foam like substance. It tasted ok, but nothing to write home about. The main course was up next, the snapper. I wasn’t a fan. The fish seemed really tough and almost tasted as if it was off. I ate a few mouthfuls and left it. 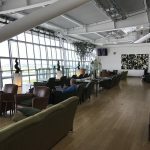 For those that haven’t been into the Concorde Room before, there’s a number of areas, the dining area with individual booths, the main lounge are and bar, and then a nice terrace area that’s open to the main terminal. It’s not a bad place to wait for an aeroplane, but it’s by no means anything terribly special. 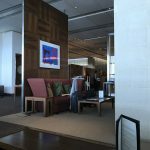 The service is nowhere near as good as the first class lounge in Zurich or in Sydney which I’d previously reviewed. My buzzer still hadn’t gone off for a shower, so I headed to the shower complex to see if it would be much longer. As I approached the lady she said that they’d tried to buzz me. I get her the device and she buzzed it again – nothing happened. Either way, I had about 45 minutes before boarding at this point so had a quick shower, getting changed into some clean clothes and generally feeling much better. I then headed towards gate A23 where the flight was a few minutes away from boarding. I mumbled something back and wandered on to the A320. I’ve previously reviewed Club Europe and not a lot has changed with the product. 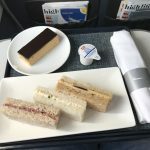 I got three small finger sandwiches as the “afternoon tea” and a couple of gin and tonics on the 90 minute flight. We landed on-time and the bags took around 30 minutes to be delivered. 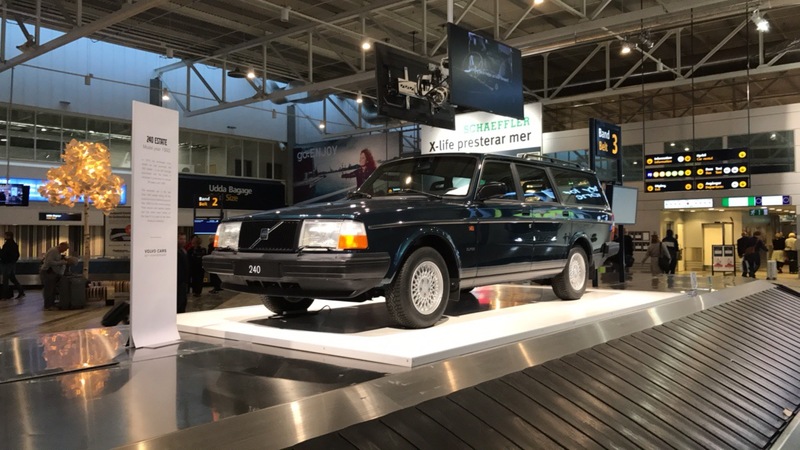 Oddly, Gothenburg airport has a Volvo 240 on display on the baggage carousel. So, the Concorde Room at Heathrow. It’s a place to wait for your aeroplane that serves mediocre food, has some lovely drinks and zero ground service at all. It’s a bit shabby really, much like the rest of BA at the moment. 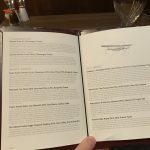 Previous Post: Swiss First Menus. Next Post: End game for Air Berlin?